Common Core continues to be a top concern in the states, with Mississippi and Wisconsin being the latest states taking steps to distance themselves from the controversial standards. This measure follows Republican Gov. Phil Bryant’s December 2013executive order affirming Mississippi’s right to define their education standards. The bill would create an advisory board to evaluate other state standards (using resources such as Fordham Institute’s State of State Standards), and introduce new Mississippi standards to the state department of education. This way the advisory board could craft a set of standards exclusively for Mississippi students, by borrowing from rigorous standards like California’s math and Massachusetts’s language arts standards, but also keeping strong standards of their own. In addition, in January, the Mississippi Board of Education voted to withdraw from the Partnership for the Assessment of Readiness for College and Careers (PARCC) consortium, which is one of the two tests aligned to Common Core, and requested proposals for new state tests on Feb. 2. Until a new test is adopted, however, the state will use NCS Pearson Inc. assessments. This was met with skepticism because Pearson signed a contract with the PARCC last year, leading to concerns that the new tests will be influenced by Common Core standards. Mississippi is practicing competitive federalism, which is the process of states evaluating their current standards, keeping what is good, discarding what is bad, and using what has worked in other states. Competitive federalism is the opposite of one-size-fits-all approaches like Common Core. Wisconsin is also moving away from Common Core standards. Earlier this month Gov. Scott Walker, R., Wis., cut state funding for the other Common Core-aligned exam, the Smarter Balanced assessment, in his budget proposal. The proposal doesn’t prohibit schools from using Common Core, but encourages district level innovation. “I want high standards—and those decisions should be made by school board members and parents and others at the local level,” said Walker in his budget address. Withdrawing from the Smarter Balanced consortium gives Wisconsin the opportunity to use a new test—perhaps approved by the University of Wisconsin-Madison—that could reflect state and district-driven standards. Common Core began as an effort to establish uniform national standards and tests, and was incentivized by billions in federal funding and waivers from the onerous provisions of No Child Left Behind. It was developed in 2009 by Achieve Inc. with oversight from the privately-run National Governors Association and Council of Chief State School Officers, but was then promoted by the Obama administration. In the midst of a recession, 46 states signed on to the standards, agreeing to implement them by the 2014-15 school year. To aid the implementation process, the federal government created two national tests aligned with the standards: the Partnership for Assessment of Readiness for College and Careers and the Smarter Balanced Assessment Consortia. The Department of Education also created a “Technical Review Panel” to oversee the validity of assessment questions. But as the deadline for implementation loomed closer, states began to realize the costs of adopting Common Core, both financial and in terms of their educational decision-making autonomy. By June 2014— two months before the implementation date— 19 states had either withdrawn from the tests or paused implementation of the standards. Four of the 19 (Indiana, Oklahoma, South Carolina and Louisiana) had exited the national standards completely. 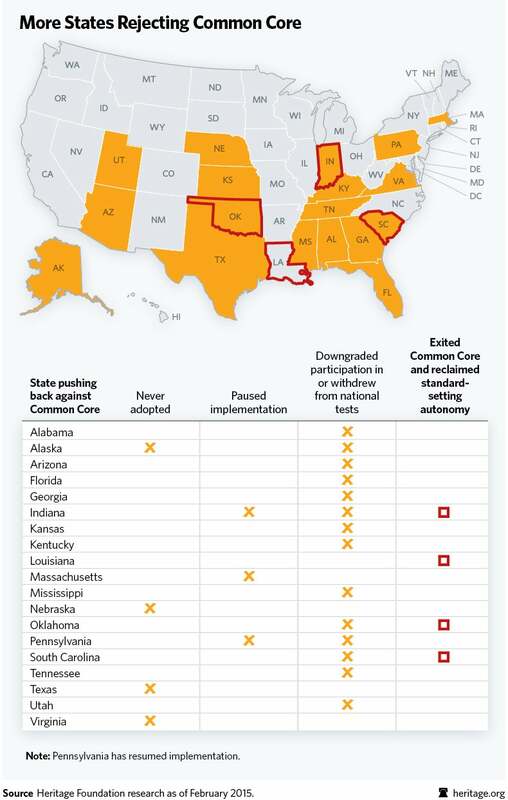 Opposition to Common Core continues to build across the nation, driven largely by parents. Quality education is best supported and fostered by those closest to the children—local leadership, teachers and parents—who are best equipped to craft an education system that fosters upward mobility and opportunity for children in their state. 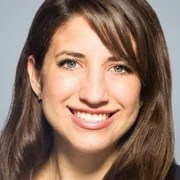 Brittany Corona is a research assistant in Domestic Policy Studies at The Institute for Family, Community, and Opportunity at The Heritage Foundation.Read her research.